Can innovative work be achieved by a program officer in a philanthropic organization? I remember asking this question when I started at the Hewlett Foundation in 2010. In my time there, I learned that program staff at philanthropies get to focus on some of the world’s biggest problems and have the advantage of using their institution’s many resources to craft the best strategies to address them and lever innovation. Eight years ago, no one could have imagined the revolutionary technological advances and innovation we have today. Yet these years will likely pale in comparison to the next eight as technology continues to develop. City landscapes have and will continue to adapt to waves of innovation, such as those created by autonomous vehicles, likely leading to a complete rewiring of streets and modes of transportation. I have seen the need to “ride the wave” of new developments, look around the corner, and make the case for new policy and new approaches to advocacy that enhance the new paradigm we are entering. While this approach itself didn’t change much in the last eight years, what has changed is the urban landscape itself. Many cities around the world have gone from a small set of transportation choices to a variety of options, aided by information technology improvements and the extensive use of smart phones. It’s hard to imagine cities without ride-sharing companies such as Uber, Lyft, Didi, and Ola, but these are all companies that emerged in the last eight years. Bike-sharing has also become a way of life in many cities – first with physical docks, and now with the invention of dockless and electric bikes. Companies like Ofo, Jump, and Mobike have existed for only a couple of years, yet they have revolutionized urban transportation, particularly in crowded metropolises like New York, Mexico City, Washington, Beijing, San Francisco, and many others. The emergence of ride-hailing, bike-sharing and other innovations in mobility were made possible by entrepreneurs seizing an opportunity and forward-looking policy and leadership from local governments. One of Hewlett’s grantees, the Institute for Transportation and Development Policy, supported officials in Mexico City to implement Ecobici. Launched in 2013, it is the largest bike-sharing system in Latin America, with over 6,000 bikes replacing many car trips through dense neighborhoods of the city. The same year, WRI Ross Center in India ran Rickshaw Challenge, the first accelerator for new mobility business for three-wheelers, which opened the door for many other improved first and last-mile connection services across the country. In the last eight years, we’ve also seen the dramatic rise of electric vehicles (EVs) in many countries, such as the United States, Norway, Germany, Japan, and China, and ambitious commitments by developing nations like India and Costa Rica. There are now 3 million EVs in the world, and cities like Los Angeles, London, Shenzhen, and Bangalore have committed to all-electric public bus fleets. As a program officer, I was given the opportunity to pivot our strategy to go beyond fixing our current internal combustion engines, to pushing for the industrial transformation of zero-emissions technologies. The rapid initial adoption and expansion of electric vehicles was made possible because of strong vision from leaders at national, state, and local governments, and because of sound policy – policies such as stringent vehicle emissions standards, vehicle mandates, consumer purchase incentives, and industrial incentives. I worked with many partners in the field to support these policies, bring knowledge to every corner, overcome barriers to consumers, foster new industry allies, and bring an equity perspective locally and globally. 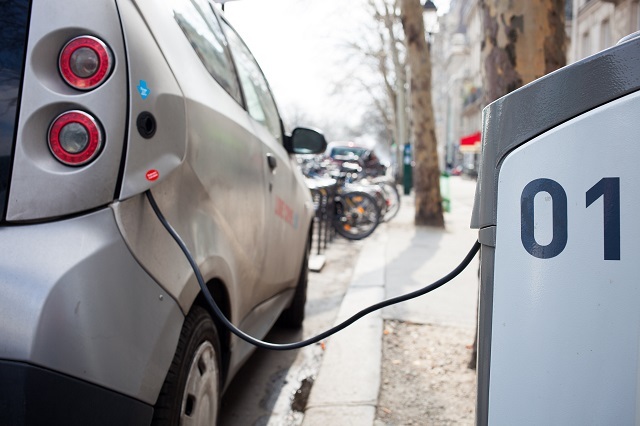 The Hewlett Foundation and other philanthropic partners contributed to the electric vehicle revolution by supporting policy development and policy advocacy. First, we supported California’s pioneering efforts through the Zero Emission Vehicle Program and advocacy campaigns, such as Charge Ahead California. Composed of a strong coalition of organizations, such as Environment California, the Greenlining Institute, Natural Resource Defense Council, Coalition for Clean Air, and Communities for a Better Environment, the campaign aims to facilitate 1.5 million electric vehicles on the road by 2025 and ensure policies have an equity component, like incentivizing access and services for low-income communities. Perhaps the most remarkable example of change that Hewlett was involved in is the New Energy Vehicle Mandate in China, one of the most ambitious countrywide policies for promoting electric vehicles in the world. If the mandate is fully implemented by 2020, China will have 4.5 million EVs. This policy benefited from collaboration across the Pacific, and organizations like the Energy Foundation China played an important part by commissioning studies and providing technical assistance. Despite the progress on electric-friendly initiatives, we still have a long way to go. Clean vehicles are still just 2 percent of vehicles sales, and we need to get to at least at 30 percent by 2030, and close to 80 percent adoption by 2050, to ensure transport plays its role in the decarbonization of the global economy. The transportation sector is one of the largest contributors to carbon pollution and climate change; its share of emissions now constitutes 23 percent of the global share. Moreover, only a handful of countries in the Paris climate agreement – 9 percent – proposed a transport sector emission reduction target. Likewise, new mobility services and cities need to find more ways to encourage shared rides and reduce the overall number of vehicles on urban streets. Some cities have reported that rather than reducing congestion, ride-hailing services are making things worse, for example. I am confident that philanthropy will continue to provide space for experimentation to achieve these goals, whether through new technologies and business models, or the policies that enable the development of those innovations and steer them toward public benefits. I am excited to contribute to the next great wave of transportation innovation that ushers in both progress and opportunity for people and the planet worldwide. A previous version of this blog appeared on Hewlett Foundation’s blog. Margarita M. Parra was a Program Officer in the Environment Program at the William and Flora Hewlett Foundation from 2010 to 2018. The Hewlett Foundation has and continues to support WRI Ross Center for Sustainable Cities.